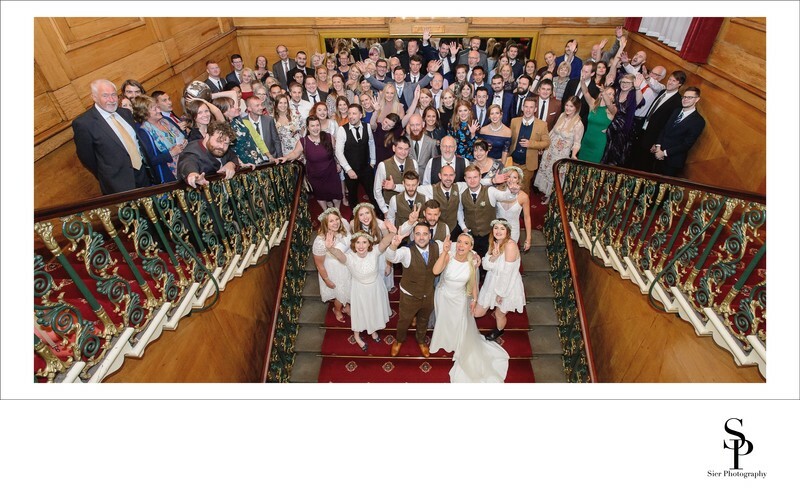 The stairs at the Cutlers Hall in Sheffield provided the perfect location for this photograph of all the wedding party for this album double page spread. The Cutlers Hall in Sheffield is a massive wedding venue with several rooms, all of them very large, this is the ultimate venue for anyone needing a larger than average wedding venue. In addition to the size of the venue, the unbelievable beauty of the hall is amazing. Some large rooms are sole less and feel to be lacking in any sort of atmosphere, this is certainly not the case her where hundreds of years of history seep out from the walls of the building making this feel warm and inviting. This image was captured on the stairs in the magnificent Cutlers Hall in Sheffield City centre, a wonderful and historic venue for a wedding celebration.